Discover the most suitable footwear to keep your feet fast, dry, and endurable. In this article, you may find both men’s and women’s boots for hunting and tourism. It is a well-known fact, that hunting requires not only good physical condition but also good equipment, and for the best experience, take only the best – best hunting spears, a predator hunting light, etc. Have you ever managed to focus on a target when freezing feet, hot spots, blisters or cramps take all of your thoughts and make every move a torment? If you choose the right pair of boots, all this painful stuff will remain unknown and your challenge will become a great adventure, despite miles of walking and hours of looking for a perfect shot for your gun or camera. I used to wear Elk Tracker model every time I got a hunting invitation from my old pal Stew who lives in Alaska. The guys from the Irish Setter took care of everything to make my feet feel dry, comfortable and endurable. I love these boots because they are soft and high enough. To be precise, they have shaft about 9.5″ from arch and boot opening of 15″ around. I consider such measures to be perfect for pursuing elks. As for the materials, you would be happy to know that this pair is made of leather and has a rubber sole. Their weight depends on size and varies up to 2 pounds. 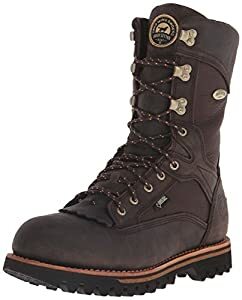 Irish Setter 880 are considered to be waterproof. And I can confirm this. I have even managed to cross a few creeks and one little river in the place where the water wasn’t too deep. Such a great experience as a result of GORE-TEX technology. In a nutshell, it provides a special membrane, which is able to block moisture and maintain an insulated but at the same time breathable environment inside. Although a special membrane lets sweat evaporate and no moisture to come in, you may doubt that some bacteria may intrude, anyway. Well, I have something to ensure that there is no reason to worry about it — ScentBan lining protects from bacteria, which causes bad odor. We all have different feet, that’s true. In order to get all the customers satisfied, Irish Setters designers have developed a footbed with memory foam (cork PU EVA), so that it can adapt to your foot peculiarities. It can be easily removed if needed. You are also allowed to push the collar or pull heel loop for easier getting on/off. In addition, this model features Bulls-Eye Air Bob Aggressive outsole, which allows moving smoothly on a tough terrain, keep balance and steady walking. Here is another pair of Irish Setters, which I like as well. However, this is not kind of regular footwear for me, even if we are talking about hunting and walking in the woods and mountains. What should be taken into account first is weight. These boys are more than 4 pounds, so you need to consider whether your feet are strong enough to walk for hours and not get tired. They are also made of leather. But the sole is different – it is synthetic. Steel shank and cork PU midsole are designed for hard work as well. GORE-TEX technology is also present here. Waterproof lining guarantees dry feet and warm walking. The product includes the 3M Thinsulate feature, which means a great durability during many hours in damp areas. ScentBan innovation is another thin, which may be interesting. It kills bacteria and prevents odors (you probably know how important it is if you are hunting for several days at a time). You may have had an experience when a brush is caught in the laces of your boot.. The manufacturer seemed to think a lot about that and came up with a lacing that can be easily removed.. Another feature that has raised comfort to the next level is a special cork footbed powered with a memory foam. As mentioned above, here you may find a synthetic sole: carbon rubber outsole featuring aggressive tread design and sticky rubber broadhead on the other side (perfect for various traction lugs). And that’s a choice of my friend Stew. 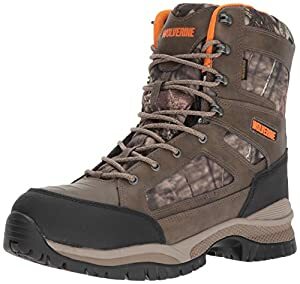 Personally, I don’t like such type of boots, but Stew believes they are the best for elk hunting. I assume it is related to his father’s and grandfather’s tastes. 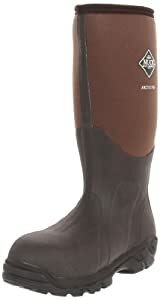 MuckBoots are close to the classic hunting boots and I need to agree that they have a lot of benefits. First thing I’d like to note – they are very high. You can wear them almost up to the knees. They are made of fabric and neoprene and have no laces. So you have to pull them on (what is not quite easy at first). 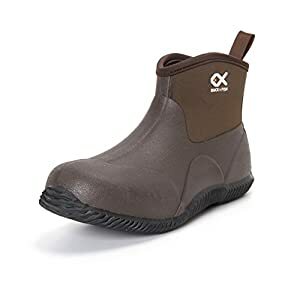 These MuckBoots are fleece-lined (to keep you warm) and include 0.3 inches of four-way stretch CR Flex-Foam to provide an outstanding comfort. As for the sole, it is synthetic (with molded outsole). Having worn this boots you may not have to be afraid of frost and snow. They keep warmth well, even when the temperature drops down to minus 50 Celsius degrees. The product got ASTM certifications for protective wear in extreme conditions. Like the other footwear in a brand’s line, this pair of MuckBoots is waterproof. Although many hunters find the pull-on method not very comfortable, you would be always confident that your foot is right in a boot. No suddenly untied laces or shaking heels. Actually, the manufacturer went beyond and has provided double reinforcements at heel, instep, and Achilles to make you sure that the boot fits perfect. 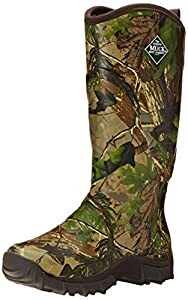 Although I define this MuckBoots model as best turkey hunting boots, some of the hunters I got acquainted with last season, used to wear them for the deer and elks as well. Basically, they are not bad, but only for the certain regions and certain weather. Having full rubber coating Muck Pursuit Snake Boots also are made of 4mm neoprene. The footwear features Xpress fabric lining in order to keep your feet cool in the summer and early fall. The sole is rubber, but if you want me to be precise, only outsole pods are rubber and midsole contains ethylene vinyl acetate. As for the weight, it’s not as good as desired – about 33 oz per boot. Muck Pursuit Snake Boots are fully waterproof. But if you notice from its name, its main advantage is an ability to withstand snakes’ strikes. By the way, this model of footwear has been successfully tested with rattlesnakes. So, if you are going to hunt in the area where snakes are widespread, this could be a good choice. This model is not recommended to be worn in the winter or late fall. Comfort range for the temperature is 4 degrees to 35 Celsius degrees. And when I talk about 4 degrees I expect you to wear warm woolen socks. There are three main technologies that take place in this product: Anti-Friction sockliner, which lets you avoid any injury or discomfort, EVA to make your steps and jumps soft, and Xpress lining, which helps feet to stay dry and cool. I’m not of those men who take their women hunting, however, I used to mix tracking animals with trips and voyage with my sweetheart. And, of course, I take care of her footwear. In 2017 we chose Sorel and were absolutely satisfied. Cozy Joan has good height and great weight. According to my wife’s words, they are surprisingly lightweight and feel like snickers. Booties are made from cowhide leather and have suede uppers. Inside there are faux fur collars and microfleece lining. This model comes in a few stylish colors, which are loved by most of the women. 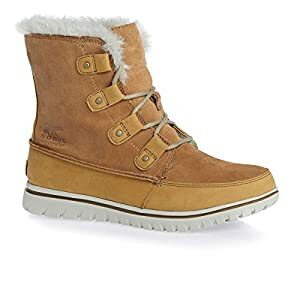 Sorel booties are waterproof but at the same time, are provided with a breathable membrane, so that feet are protected from moisture, rain, puddles, and snow on the one side, and from sweating – on another. All that women need to know about these booties – they are not clunky, unlike many warm women’s footwear. Because they are lightweight, soft, warm and nice, women can wear them for a long journey to Europe or Canada or use daily when it is snowing. High-quality outsole stands well on ice. It is also allowed to remove molded PU footbed. I have not tried anything from Wolverine brand yet, but some of my friends highly recommended this manufacturer. They say they are really impressed with waterproof and lightweight features. These hunting shoes are made from premium leather and high-quality textile. It seems that the rubber sole contains some secret ingredients, which make boots very lightweight. A shaft is about 8 inches from the arch, which is considered to be a good size. And you would definitely appreciate the color (Natural/Mossy Oak), which is able to deter deer and elk eyesight. You can easily go tracking through the woods, muds and creeks, However, these boots are not warm enough and can’t withstand strong frost. From the advantages, I would like to highlight 3M-Thinsulate insulation, which helps to keep shoes water-resistant. 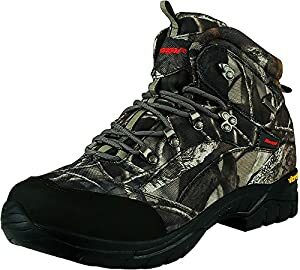 Wolverine hunting shoes are known to be durable against tough conditions and able to provide all-day long comfort for active people. And even if you are walking, hiking and running from the early morning till the sunset, your feet would be dry anyway. That’s a trick of breathable membrane powered with moisture-wicking mesh. I used to hunt elks in the North with a lot of snow, creeks and rivers. So I didn’t have a chance to try this Hanagal model. They are too low for me. But my friend from Wyoming did. He described them as the best mountain hunting boots he ever worn. Low size and camouflage color are supposed to be an excellent design solution for the hunters who track elks in Nevada, Arizona, California and New Mexico. Rubber toe cap is good for some hiking in the mountains. In addition, guys from the Hanagal point out that shoes should fit snug in all ways, but not tight. Thus, they left some space where the toes are placed, so that you can wiggle-waggle. Despite the fact that these bushland hunting boots don’t look pretty resistant, they are waterproof. Moreover, KingTex membrane allows sweat evaporating while protecting from the water outside. So you may be sure that your feet won’t be wet and stinky. In addition, gusseted tongues prevent not only water, but also dirt, sand, and pebbles. Probably, the most interesting thing I found in these boots are anti-bacteria (and anti-fungus) footbeds. They come as anatomically-shaped and can be easily removed if needed. But the main point is that they provide excellent ventilation and prevent unpleasant smell. Another outstanding feature is Vibram outsole for a comfortable traction on different surfaces. One more pair of shoes that doesn’t match my taste. However, many of the European hunters I am happy to know, and Andre, my godfather from Canada, have at least two pairs of Duck & Fish. And below you may find the reasons why. Made of rubber and neoprene, this model is considered to be good ankle hunting shoes. They are designed in a classic European style and are quite lightweight. Although their height is only seven inches, hunters often use them in lake and backwater areas. I think it is ok, if there is no high wet grass. The boots have fleece lining inside to keep feet dry and warm. Duck & Fish shoes are waterproof. They are perfect for rainy days, when there are a lot of puddles, and are easy to wash. You can also wear them in the snow, but if it is colder than -5 Celsius degrees, you won’t feel comfortable. The boots can also protect from snake attacks. You can easily pull the shoes on/off thanks to the special pull tab. There are also removable insoles (it is great if you have spare ones). The outsole, made of calender rubber, guarantees sturdy and reliable traction in any weather conditions. 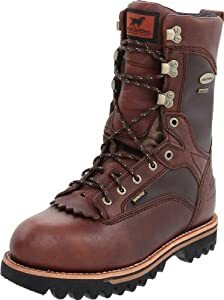 One more Irish Setter I’d like to include in my hunting boots review. In my humble opinion, they would be great for big guys because of the weight. Additionally, this model offers extended sizes. 882 model is made of premium Goodyear leather and has welted construction. They look very reliable and have 12 inches in height. 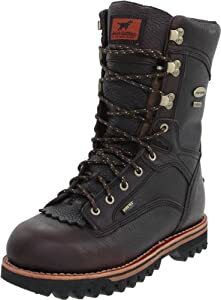 At first, you may be confused with the price, but when you take into account 600-gram 3M-Thinsulate insulation and GORE-TEX fabric lining, you would consider these are good boots for the price. Like other Irish Setter footwear, 882 model features ScentBan technology in order to prevent odor-causing bacteria becoming outspread. The boots are waterproof and can be used in the winter or late season hunting. They also show good result in the deep snow, you may wear them even in those days when the temperature drops down to -10 Celsius degrees. Irish Setter 882 is one of the leaders in Elk Tracker series. So, if you are going elk hunting, you should definitely take a look. According to some of my friends, they were surprised how fast they could break in (however, it took a bit more time to wear the boots out). EVA footbed comes with memory foam, which can be easily removed, and this is one more benefit for your comfort. As for outsole, it features sturdy cleats to let you unhesitatingly grab hold on any terrain. As a bonus, you get leather protector and NaturSeal for boot care. A perfect choice for women who like hunting in North America. These MuckBoots are quite warm, lightweight, high and stylish. 12-inch height allow tracking elks, deer and hogs in the snow and backwater. If you want to learn more about product’s dimensions, here they are: shaft is about 15″ from arch, heel – 1.5″, platform – 1”, opening – 16.25″ around. They are made of rubber and 4mm neoprene. To keep gentle feet warm and dry, the manufacturer has provided PK mesh lining. 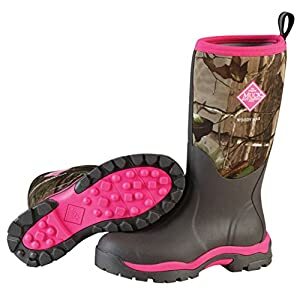 These women’s MuckBoots are waterproof. You may be sure you can easily go through the creeks, streams, wades, and snowdrifts. But the main point is that they are able to withstand frost and cold going down to -10 Celsius degrees. The boots are easy to break in and stretchy around the calf to protect you from the wind and cold. MS2 Bobbed and molded outsole keeps you sturdy on any surface, even on ice. The midsole is constructed especially for women’s foot in order to provide excellent comfort and prolong the walking time before you get tired. I hope you find my hunting boots review very helpful and make the right choice. I am always happy to share my experience and tips. If you are looking for other gear before going hunting, please have a look at my Best shooting bags review.